The courageous, straight-talking Republican from Florida has co-sponsored the Open Fuel Standard Act. If anyone understands the threat to our national security posed by our continued funding of Wahhabism, it is Congressman Allen West. His understanding of radical Islam is unsurpassed among elected officials. He understands fully that it is the tremendous wealth of the Saudis that allow them to fund and therefore control ninety percent of the Islamic institutions of the world, to build thousands of mosques, to build madrasses that provide free daily meals to poor Muslim boys so they'll attend and then teach them to hate non-Muslims, to invest in news outlets that promote hatred against the United States, to financially support terrorist training centers, and to pay for the financial support of the families of suicide bombers. Congressman Allen West fully understands that the Wahhabis are able to do all this because of the tremendous amount of money we give them because so far we have been unwilling to break their monopoly on the transportation sector. And he sees that the Open Fuel Standard would effectively end oil's monopoly and greatly weaken OPEC's power over America's economy and the Wahhabis' influence over the Islamic world. 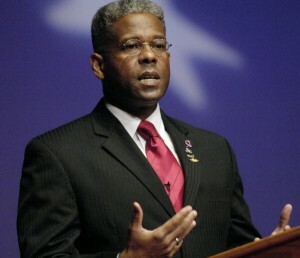 If Congressman Allen West is your representative, please give him an enthusiastic thank you. And if you know any fans of Rep. West, please let them know he has signed on as a co-sponsor of one of the most important bills to be introduced into the House: The Open Fuel Standard Act of 2011. Join Rep. West on Facebook here. Join him on Twitter here.